Two years ago, Taiwanese pop legend Jay Chou (周杰倫) purchased a NT$660 million penthouse in the wealthy Heping District of Taipei, at NT$660 million. The property includes a 360 degree observatory on the topmost floor, and a snippet of the view was revealed by Jay’s wife, Hannah Quinlivan (昆凌), today. Jay and Hannah have two children—daughter Hatahway born in July 2015, and a newborn son born last month. Hannah is still in her one-month postpartum recovery, but she likes to update her fans on what she’s been up to with her family. 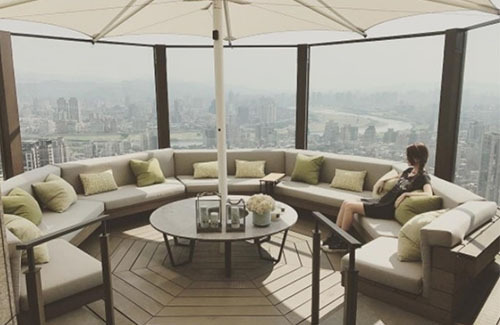 In the photo Hannah shared, the 23-year-old is sitting in a wrap-around couch inside the observatory, which overlooks the view of Taipei. “The top floor is public. The weather was good so I took a picture,” said Hannah on her Instagram.